Rnd 5) ch 2 (this does not count as first st in this row or the following rows) hdc in each st around. Join with slst to first st 28 sts. Rnd 29) ch 1 . sc in each st around. join with slst to first sc. Maxine wears a size 7 shoe and these fit her as an ankle length sock. These stretch a little to fit over the heel. 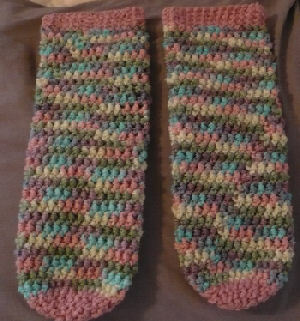 You can also add a few rounds in the body of the sock to increase the length of the sock. these are comfortible to wear and stay on your feet when you sleep. And here are the perfect tools for making these awesome sleep-socks! Do you like this website page? Click here to refer it to a friend! All content is copyrighted to original creators. You may print out pages for yourself, or for charity groups IF credit is given on each page to Bev's Country Cottage. DO NOT publish this content on other websites, blogs, forums, in emails, mailing lists, in any print media. DO NOT sell these patterns, or items made from them. These patterns are for humanitarian or family/gifts ONLY! Direct linking to a pattern or recipe is allowed.